An integrated innovation strategy would provide food solutions to millions by combining innovations in several ecosystem elements and their convergences. This article presents a model that elaborates on this plan. When all people at all times have access to sufficient, safe, nutritious food to maintain a healthy and active life, food security is ensured. This definition by The World Food Summit of 1996 incorporates both the physical and the economic access to food, which is essential for the government for framing its policies. Though experts have lauded India’s economic progress in the last decade, this growth has not benefitted the majority who still lurk below the poverty line. In an effort to reach out to this segment, the government has launched initiatives such as the public distribution scheme, the mid day meal program for school children, the National rural employment scheme (NREGAS). The public distribution system (PDS) supplies raw materials such as whole grains and sugar at nominal rates. The mid-day scheme, which sources from the PDS, was developed to increase school attendance, ensure regular enrolment while providing the student with basic nourishment. The National rural employment scheme (NREGA) is aimed at enhancing the livelihood security of people in rural areas by guaranteeing hundred days of wage-employment in a financial year to a rural household whose adult members volunteer to do unskilled manual work. To tackle the phenomenal task of eradicating hunger, the government initiatives alone are not enough. Supplementing their efforts are NGOs such as the Akshaya Patra, which reaches out to about 1.2 million children in 8,208 schools in 18 locations across eight states of India, providing them with freshly cooked meal packed in stainless steel containers on all school days. Andhra Pradesh and Tamil Nadu also have similar initiatives. The government teams with some NGOs to increase their reach. The business processes can be identified, streamlined, standardised and automated or semi-automated using IT and sensor networks. At the other end of the spectrum, there are millions of hawkers, who are termed illegal traders by the municipalities, serving the food needs of the urban poor and lower middle class. Organizing these discrete entities together in an effective food security supply chain would result in a high impact solution serving millions below the poverty line while also generating millions of jobs. The PDS works through ration cards and supplies only the basic dietary needs. Nutritious supplements such milk, meat and eggs should be provided. The food is often cooked in window-less shelters creating carbon monoxide poisoning problems especially for children. In order to keep PDS functioning, the government has initiated the minimum support price policy and also has created the food corporation of India for storage of the grains. The location and capacity of the kitchens, the push carts and other retailing outlets can be determined using standard optimization techniques from the demand estimates. Though the government created the NREGAS for the benefit of the rural unemployed, the projects created for supporting the scheme have no long term potential. The government spends thousands of crores of rupees on such schemes without any tangible benefits. Currently there are several successful food suppliers implementing part of the schemes. They include Akshaya Patra and other mid-day meal programs serving more than 1.3 million school children a day. Also catering to the millions who cannot afford restaurants are the street hawkers. Kolkata’s 145,000 lakh street food vendors – no other Indian city has as many – cater to nearly 10 million people. That street food can be healthy and hygienic has been proven by Kolkata’s Hawker Sangram Committee (HSC), which, in association with the city-based All India Institute of Hygiene and Public Health (AIIHPH), has been conducting training programs for food vendors on health and hygiene issues and quality control. Periodic tests by the Institute, the Kolkata Municipal Corporation and the state health department have revealed that this street food is nutritious and safe. What is missing is an integrated, co-evolutionary innovation strategy that would provide high service quality food solutions to millions of people by combining innovations in several of the ecosystem elements and also their convergences. The business processes can be identified, streamlined, standardised and automated or semi-automated using IT and sensor networks. Modernization and Integration of PDS, midday meal program, vocational training programs under NREGAS, hawkers, and small food outlets using communication technologies would lead to a block buster industry serving the poor and creating millions of jobs for not so well educated. NREGAS can be used for training chefs, cooks, hawker owners, PDS employees, school employees etc. Standardised and automated kitchens and IT-enabled and GPS equipped push carts can be developed. The push carts can be built following standardised design and equipped with solar or gas run refrigerators and ovens. The entire process can be monitored, executed and controlled using a call center. The call center can act as an orchestrator of the entire activity by tracking the hawkers, the food packets and keeping tabs on the consumption patterns. The distribution centers can be owned by the big brand retailers and the kitchens can be privately owned by the five star hotel owners. The food packets can be bar-coded or tagged with RFID and can be tracked by the cloud computer servers. Free food can be given instead of ration cards against the thumb print (UID) at the hawker vehicle. The hawkers and small hotel owners can be funded by micro finance organisations. The location and capacity of the kitchens, the push carts and other retailing outlets can be determined using standard optimization techniques from the demand estimates. The server in the City cloud can keep track of the food packet issued for settlement later. The Integrated Food Supply Chain is shown below. Standardised food outlets with fixed menu can be opened at various places in the city and take home facility can be provided nearer to the kitchens. Given the perishable and hygienic nature of the supply chain, the products are made in the day and whole produce ends by the night. This requires careful demand forecasting, routing and rerouting of the supplies and monitoring of the anti-social activities. 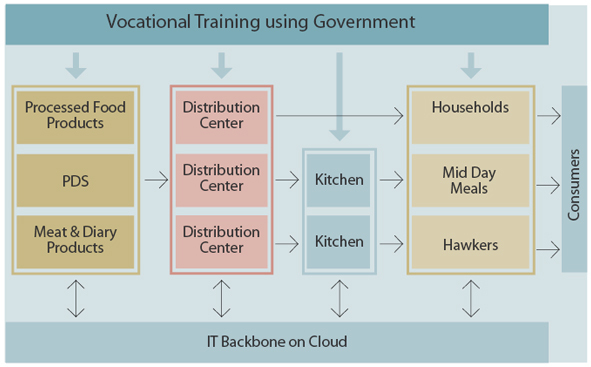 The program needs trained logistics and IT manpower and millions of other jobs. Several product and process innovations are needed and there are opportunities for several small and big private entrepreneurs. This is a unique opportunity for people from diverse fields: FIIs, governments, NGOs, big business houses, small entrepreneurs and micro finance agencies need to come together to make this program successful. 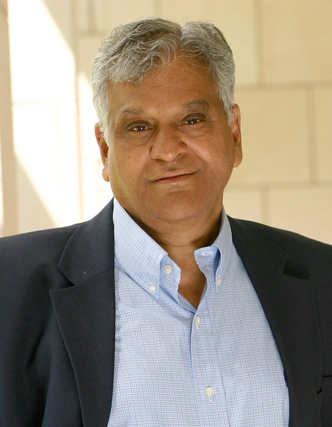 Clinical Professor and Executive Director of the Centre for Global Logistics and Manufacturing Strategies at the Indian School of Business (ISB).